You will be thrilled with the choices you have for Tampa Florida hotels that are ideally located when you want to see a specific attraction within the area. The Grand Hyatt Tampa Bay is a beautiful resort style hotel within a nature preserve set on Old Tampa Bay near the airport. Other properties located on the waterfront and near the Tampa Convention Center include Westin Tampa Harbour Island as well as the Sailport Waterfront Suites has a beach area. The Comfort Inn at Fairgrounds-Casino sports easy access to the Florida Fairgrounds and the Barrymore hotel Tampa Riverwalk where you can walk to the Tampa Arts District. The Holiday Inn Express hotel and Suites New Tampa I-75 Bruce B. Downs as well as the Hampton Inn and Suites Tampa-North boast great access to Busch Gardens Tampa. You can find value and added bonuses in all these hotels that will please your family. The Holiday Inn Express hotel and Suites New Tampa I-75 Bruce B. Downs is a superb Tampa Florida hotel selection for families that want to be close to Busch Gardens Tampa. 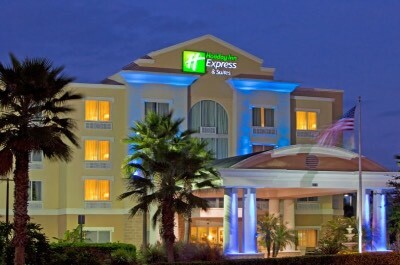 Situated in New Tampa, the Holiday Inn Express hotel and Suites New Tampa I-75 Bruce B. Downs has comfortable accommodations and is one of the closest hotels to Busch Gardens and Adventure Island Water Park. The Holiday Inn Express hotel and Suites New Tampa I-75 Bruce B. Downs has a modern high rise architectural design with 100 rooms and suites that sport a clean contemporary decor. Standard guest rooms are normal size with a choice of bedding and a small kitchenette. Studio suites are larger with a choice of bedding, an integrated sleeping/living area and a small kitchenette. One-bedroom King Executive suites are spacious with a separate living room and a kitchenette. The Presidential suites are perfect for families with two-bedrooms, 2-bathrooms, a separate living room and a kitchenette. All rooms and suites offer views of the surrounding area but there are no balconies. The Holiday Inn Express New Tampa I-75 Bruce B. Downs boasts an easy 7-mile drive to Busch Gardens Tampa and Adventure Island Water Park as well as the Museum of Science and Industry. Outdoor activities can be found at Lettuce Lake Park as well as shopping at the Tampa Premium Outlets which are only 4-miles away from the hotel. You are quite a distance from downtown and the beautiful beaches of the Tampa area. The property sports a lagoon-style freshwater swimming pool with a nice sundeck and a fitness center. An added bonus is the complimentary breakfast served daily but there is no onsite restaurant. Offsite dining includes several chain restaurants within walking distance like Chili’s, Ruby Tuesday as well as Stonewood Grill and Tavern which serves grilled cuisine and Liang’s Bistro prepares Pan Asian. Nightlife can include a drink at Glory Days Grill while watching sports, Starlight 20 for movies or stop at Tricks the Magic Theater after your visit to Busch Gardens Tampa. The Grand Hyatt Tampa Bay is a resort style Tampa Florida hotel that offers plenty of onsite amenities and overlooks Old Tampa Bay. Situated on a 35-acre nature preserve the Grand Hyatt Tampa Bay is very close to the highway and a 15-minute drive to the downtown area. The Grand Hyatt Tampa Bay has a unique modern high rise architectural design with 442 rooms, suites and casitas which boast a modern decor. The Grand Hyatt Tampa Bay offers two levels of service including the Grand Club which provides a private with food and drink as well as upgraded room amenities. Guest rooms start at 350 square feet with a choice of bedding and views of the bay or surrounding area from floor to ceiling windows. One-bedroom Executive suites are sized at 700 square feet with a separate living room, 2-bathrooms and a great view of the bay from floor to ceiling windows. One-bedroom Premier suites are corner units with 750 square feet and a separate living room, 1-bathroom as well as views of the bay from floor to ceiling windows. VIP suites have 1,100 square feet of living space with one-bedroom, a separate living room, 1.5-bathrooms and expansive views of the bay from floor to ceiling windows. Presidential suites are sized at 1,300 square feet with one-bedroom, 1.5-bathrooms, separate dining area, a living room and big views of the bay from floor to ceiling windows. Within the nature preserve there are villas that are 350 square feet with an integrated living space and patio with view of the preserve. One-bedroom Casitas are sized at 750 square feet on two-levels of living space with a separate living room, kitchenette, 1.5-bathrooms and a patio with views of the preserve. Most attractions are over 1.5-miles from the Grand Hyatt Tampa Bay and the Bayshore Boulevard Greenway is almost 5-miles. You will need to drive 20-minutes to reach the Tampa Arts District where you will find the Curtis Hixon Waterfront Park and Florida Aquarium. The Grand Hyatt Tampa Bay has plenty of amenities onsite which include two freshwater swimming pools which have gorgeous sundecks and poolside service. You can also enjoy a calming nature within the 35-acre nature preserve. The property boasts tennis courts and a fitness center onsite. Dining onsite includes three restaurants which are 1823 Kitchen and Bar for all three meals, Oystercatchers prepares seafood and Armani’s serves Italian cuisine with a breathtaking 14th story view of the bay. Nightlife onsite includes a stunning sunset from either the deck at Armani’s or the Oystercatchers and there is live entertainment on selected evenings. The Hampton Inn and Suites Tampa-North is a great mid-range Tampa Florida hotel for families and travelers looking for comfortable accommodations with added amenities. Situated in the Hidden River Corporate Park just a short walk from Lettuce Lake Park, the Hampton Inn and Suites Tampa-North is only 6-miles to the animal themed park Busch Gardens Tampa. The Hampton Inn and Suites Tampa-North has a modern three story architectural style with 126 rooms and suites that boast a modern decor. Guest rooms are ample sized with a choice of bedding and there is an option for a king with study that is slightly larger with a sofa sleeper. One-bedroom suites have a choice of bedding, separate living room, kitchen and views of the surrounding area. 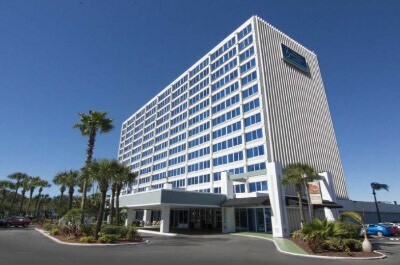 The Hampton Inn and Suites Tampa-North sports easy access to Busch Gardens Tampa, Adventure Island Water Park and it is less than 3-miles to the Museum of Science and Industry. Outdoor adventure can be had within walking distance at Lettuce Lake Park as well as Morris Bridge Park and Clearwater Beach is an hour away. The Hampton Inn and Suites Tampa-North has a good freshwater swimming pool with a sundeck and a fitness center onsite. You receive a complimentary breakfast daily but there is no restaurant onsite. Offsite dining involves a short drive to the Cazador Grill for Latin dishes, Bangkok Jazz serves up Asian specialties and Stefano Greek Italian Restaurant. Nightlife requires driving to see Tricks the Magic Theater or maybe a cold beer at Yuengling Brewery. If you want to stay in a mid-range value oriented Tampa Florida hotel that offers spacious accommodations for all types of travelers then the Quality Inn and Suites near Fairground Ybor City is a perfect choice. 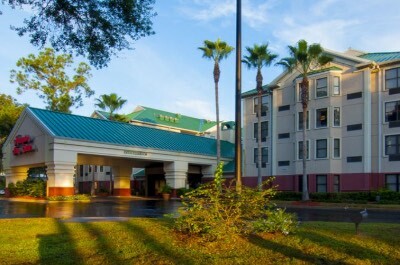 Situated just off of I-4 and North 50th Street, the Quality Inn and Suites near Fairgrounds Ybor City boasts easy access to many of the areas attractions such as Busch Gardens Tampa, Ybor City as well as the Fairgrounds and is only 4-miles from the Tampa Cruise Port Terminal. The Quality Inn and Suites near Fairgrounds Ybor City has a modern low rise architectural design with 125 rooms and suites that boast a modern decor. Rooms are spacious with a choice of bedding and views of the surrounding area. Suites are larger with a sofa sleeper as well as views of the pool. Downtown is a 10-minute drive where you can find the Tampa Arts District, the hotel is a 5-minute drive to Ybor City which is packed with Latin culture and you are just minutes from Busch Gardens Tampa. The Quality Inn and Suites near Fairground has a freshwater swimming pool with a nice sized deck for sunning and relaxing as well as a fitness center. Dining onsite includes a complimentary breakfast with offsite choices include Brocato’s Sandwich Shop which is within walking distance and La Terrazza Restaurant as well as the Columbia Restaurant for Cuban cuisine can be found in Ybor City. If you are here on Sunday try the Wat Mongkolrata Temple for a fantastic Thai cuisine based brunch. Nightlife could include choices like the Silver Dollar Tampa Lounge for live music and the Seminole Hard Rock Casino is only 4-miles away as well as nearby Ybor City offers King Corona Cigars Cafe and Bar. When you are searching for a mid-range Tampa Florida hotel that is close to many exciting attractions and directly on the Tampa Riverwalk, then the Barrymore hotel Tampa Riverwalk is a superb selection. Situated in downtown within a 5-minute walk to the Tampa Museum of Art, Tampa Theatre and 2-miles from the Tampa Cruise Port Terminal, the Barrymore hotel Tampa Riverwalk puts you right in the middle of the action. The Barrymore hotel Tampa Riverwalk has a modern high rise architectural style with 332 rooms as well as suites that were renovated in 2016-17 and boast a contemporary decor. All guest rooms are normal sized with a choice of bedding and offer city views from large windows. One-bedroom suites feature more living space with an integrated living/dining area, kitchenette and views of the skyline. The Barrymore hotel Tampa Riverwalk has a great spot along the Tampa Riverwalk which allows for easy walking access to such attractions as the Glazer Children’s Museum, Florida Aquarium and you are only 1.5-miles from Ybor City. The hotel also provides a complimentary shuttle service within a 2-mile radius. Spectacular white sand beaches like Madeira, Pass-A-Grille and Treasure Island are all within an easy 45-minute drive. The Barrymore hotel Tampa Riverwalk has a freshwater swimming pool with sundeck and a fitness center. Dining onsite at the property includes Waterworks for breakfast, lunch and dinner. There are several quality restaurants within walking distance that include Ulele for seafood, Bavaro’s Pizza Napoletana and Pastaria as well as Edison which serves American cuisine. Nightlife is abundant along the Tampa Riverwalk with the Straz Center for the Performing Arts, comedy at the Tampa Improv or enjoy a craft beer at Six Ten Brewing. 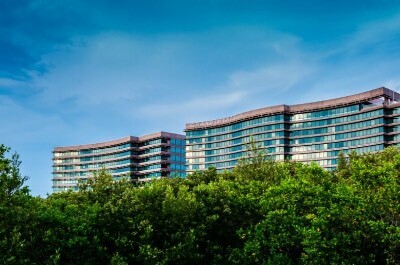 If you are seeking a luxury Tampa Florida hotel that is close to many of the exciting attractions of the area then the Westin Tampa Harbour Island is great choice for all travelers. 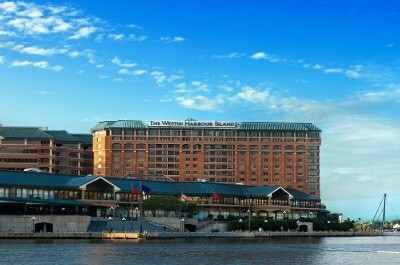 Situated on the shoreline of Harbour Island overlooking Hillsborough Bay, the Westin Tampa Harbour Island is within walking distance to the Tampa Convention Center and the Tampa Arts District where you will find the Florida Aquarium as well as less than 1-mile to the Tampa Port Cruise Terminal. The Westin Tampa Harbour Island has a modern high rise architectural design with 299 rooms and suites which boast a traditional decor. Traditional Rooms are sized at 280 square feet with a choice of bedding. Deluxe are similar but situated on higher floors within the building and offer views of the city skyline or harbor. Premium rooms are 280 square feet with floor to ceiling windows that sport a view of the harbor. Junior suites are 650 square feet with a separate living area and skyline views. Luxury and presidential suites range from 1,400 to 1,800 square feet of living area with a separate living room, 1.5-bathrooms and a view of the harbor/skyline. The Westin Tampa Harbour Island is within walking distance to many exciting attractions like the Tampa Riverwalk, Curtis Hixon Waterfront Park and the Tampa Museum of Art as well as the SS American Victory Mariner’s Memorial and Museum Ship. If you are searching for a beach you are a 45-minute drive from St. Pete Beach and Clearwater Beach. The Westin Tampa Harbour Island has a good freshwater swimming pool with a sundeck overlooking the bay and a fitness center onsite. Dining at the hotel includes grab-and-go meals at the Marketplace and all three meals at 725 South. There are plenty of restaurants within walking distance that include the Columbia Cafe-Riverwalk Tampa for Cuban, Jackson’s Bistro Bar and Sushi as well as the Oxford Exchange which swerves contemporary American cuisine. Nightlife can include a walk on the Tampa Riverwalk or enjoying the sunset with a cold drink at the Sail Pavilion on the Riverwalk, attend a performance at the Tampa Theatre and you can catch a game at Champions Sports Bar. When you are searching for an all-suite waterfront Tampa Florida hotel that is great for all types of travelers then try the Sailport Waterfront Suites. 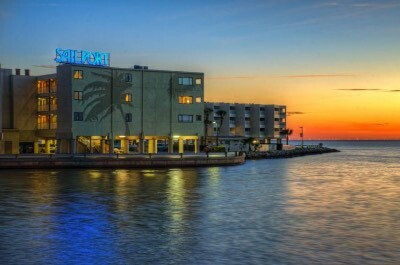 Situated on the shores of Rocky Point Island overlooking Tampa Bay, the Sailport Waterfront Suites is just minutes from the Westshore business district and 10-minutes from Tampa International Airport. The Sailport Waterfront Suites has a modern high rise architectural style with 191 suites that feature a contemporary beach decor. One-bedroom waterfront suites have 515-560 square feet of living area with a separate living room, full kitchen, dining area and private balcony with view of Tampa Bay. One-bedroom waterfront deluxe studio suites are sized similar with a different floorplan which features a separate living area, full kitchen and private balcony with bay views. Two-bedroom waterfront suites are sized at 840 square feet with 2-bathrooms, separate living room and dining area as well as a private balcony with views of the bay. The Sailport Waterfront Suites has a small beach area that is great for lounging and sunsets. There is a fishing pier onsite and you have access to complimentary fishing gear for your pleasure. You are within walking distance to the Courtney Campbell Trail for a scenic jog or bike ride and there are standup paddleboards rentals along the bay. The Sailport Waterfront Suites is a short drive to Cypress Point Park, the Horse Power for Kids and Animal Sanctuary as well as to the Tampa Arts District where you will find Curtis Hixon Waterfront Park, the Tampa Museum of Art and Glazer Children’s Museum. The Sailport Waterfront Suites has a nice freshwater swimming with a gorgeous sundeck that overlooks the bay as well as a fitness center, mini-market and fishing pier. Dining includes a leisurely home cooked meal and Pearly’s Beach Eats at Sailport serves all three meals near the pool area. Offsite dining selections within walking distance are the Rusty Pelican for seafood, Whiskey Joe’s prepares American cuisine and Bahama Breeze serves Caribbean dishes. Nightlife includes a stunning sunset from the sundeck and there are fire pits along the beach area. Offsite attractions within a short drive include the CineBistro at Hyde Park Village, Longbar Pub for a cold libation or have a cigar at Davidoff of Geneva since 1911. When you are looking for a mid-range Tampa Florida hotel that is near the cruise port as well as the airport the Holiday Inn Tampa Westshore is great selection for you. Situated in a perfect location to start your adventures, the Holiday Inn Tampa Westshore offers an easy drive to many of the areas outstanding attractions. 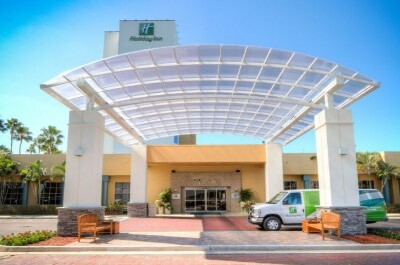 The Holiday Inn Tampa Westshore has a modern high architectural design with 261 rooms as well as suites that were renovated in 2015 and sport a contemporary decor. You can upgrade your room and suite to Club Level which includes dedicated concierge services, upgraded in room amenities, a complimentary continental breakfast as well as an evening get together with hors d’oeuvres and beverages. Guest rooms are standard size with a choice of bedding. Junior suites are sized at 600 square feet with a private bedroom and separate parlor room. One-bedroom executive suites have 900 square feet of space with a separate living room and dining area. The Holiday Inn Tampa Westshore is conveniently placed within walking distance to the West Shore Plaza for shopping, the Escape Countdown for entertainment and you are a 4-mile drive to the Tampa Arts District. There is a complimentary shuttle for guests to use within a 3-mile radius of the hotel. If you are searching for something outdoors then the Bay Shore Boulevard Greenway is 3-miles away. The Holiday Inn Tampa Westshore has a a freshwater swimming pool and fitness center onsite. Dining onsite includes the Marketplace for grab-and-go delights as well as bar700 which prepares America cuisine with a twist. Offsite dining selections within walking distance can include Charley’s Steak House and Market Fresh Fish, Seasons 52 prepares American and Besito Mexican serves Latin dishes. Nightlife is loaded in the area with numerous restaurant bars like the Cigar City Brewery or you can catch a movie at the AMC West Shore 14 or enjoy a glass of your favorite wine at Cooper’s Hawk Winery and Restaurant.